Everybody loves a good base-building game. Creating something out of nothing, leading your people to prosperity… At some point, however, there comes a time in the game’s life where you think: “Wouldn’t it be cool if I could do that?” Sadly, not all games can give you the versatility you need in your choices. Enter Rimworld, the game where you can do pretty much anything. In Rimworld, you play the mastermind behind a group of colonizers stranded on a foreign, unknown planet. You have to fight against the land’s beasts and inhabitants, and even nature itself. Supposedly, the game’s ultimate goal is to build a ship to get off the planet, but believe me, you won’t want to leave by the end. After you choose a Narrator (basically the game’s difficulty) you get to make your colonists. You can either randomize them or build them yourself through a points system. Following that, you can choose where on the planet’s surface you want your group to crash. After that point, the main portion of the game begins. Your goal is to build up your colony, gather resources and protect yourself from enemies, while at the same time you research technology to get off the planet. 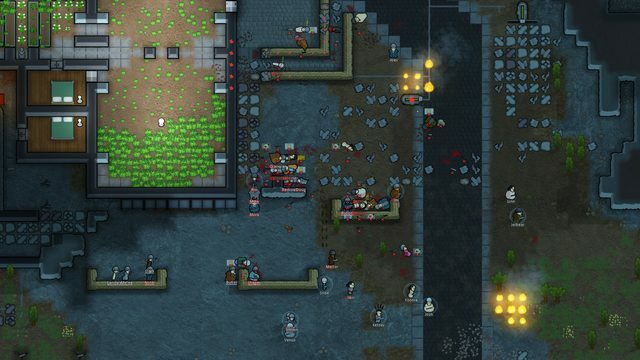 Although the above elements are fairly standard in most games like Rimworld, it’s the way Rimworld implements them that make them stand out. Basically, every person in your group has his own skills. One might be good at farming, one might be a good doctor, and so on. You can give each person’s skill a numerical value, which represents his tasks. For example, if one guy has a 1 in medicine, he will be the one who will rush to heal the others. The game’s AI follows this numerical system to determine which job belongs to who. On top of that, every person has his own quirks. For example, someone might disdain manual labour. This means that he never carries anything. Another might be a pacifist who will never fight. If you want your colony to survive, you must also manage these quirks. Finally, every person in your group can have breakdowns. Living on a foreign planet rife with danger is a stressfull thing, and if a colonist’s needs are not met and his happiness plummets, he might break. Depending on the colonist, this breakdown might be different. Some might just wander around the base aimlessly. Others might go berserk and start attacking anything they see. Others might go burn a forest down. Apart from your colonists and their needs, another thing that can destroy a colony is nature. Rimworld has a season system which you need to adapt to. For example, during winter, nothing can grow outside, which means that you must find other means to keep your food supplies filled. Once again, the game offers many different ways for that. You can build greenhouses, stockpile food in a freezer, go hunting, or trade with other groups. Like everything else, half the magic in Rimworld is not the problems you face, but the fact that you have so many ways to overcome them. Lastly, you also need to contend with random incursions into your territory. Space pirates might attack you. Shipwrecked robots might spring up to protect their ship. Clans might fear you and decide to strike first. It is up to you to fight or conduct diplomacy with them. Over the course of the game, chances are you will lose many colonists, or even your whole colony. Rimworld is not the kind of game where you can ever feel truly safe. In most base-building games, like Banished, there comes a point where, even if something disastrous happens, you have the necessary things to rebuild. Rimworld, on the other hand, always has you on edge. There are simply too many factors and mechanics built into the game that can really do a number on you. Despite that, however, the game feels not only fair, but also really fun. These random events make for some fantastic storytelling. The Steam page for the game itself says that Rimworld is a story generator, and it’s true. Colonists have relationships with each other. They can be friends, lovers or rivals. The random events that happen thanks to the narrator influencing their mood and their well-being. All of this leads to some fantastic stories, which can range from how you managed to destroy a whole robot group with just one guy (who is now a hero in the eyes of the other colonists) to how one tortoise destroyed your whole colony (true story). Play enough Rimworld, and you can create stories that rival the best TV has to offer. And there’s even more. Tired of standing around in one place on the planet? Migrate! Make more camps! Need company other than the colonists? Tame some wolves, or bears, or literally anything. Your colonists are bored? Make them create art, play chess, get high… The possibilities in Rimworld are honestly endless. And you know what’s the best thing? The game is still in Early Access. It has more stuff in it than pretty much anything I’ve ever played, and there’s more coming. Finally, there’s the art and sound. The game has the exact same style as another fantastic indie, Prison Architect. Personally, it’s a style I enjoy quite a lot. It’s both cute and easy to see what’s going on. In terms of music, it reminds me of some sci-fi staples, like Dune and Firefly, which is a great thing. To sum up, Rimworld is not just a simple base-building game; it’s a story you get to shape however you like. 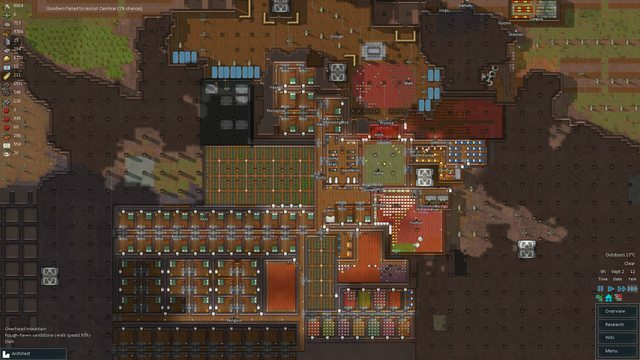 You can do pretty much anything with your colonists, and the game can be played again and again. Even better, the game can be modded, so you can add even more stuff, like more music, weapons, and mechanics. Rimworld might be in a preview state, but honestly, it has so much material in it that you can devote yourself to it for months. So, if you were looking for a game where you can really dive in and do thousands of things, this is it. You can find Rimworld on Steam for 28 euro.